Osteoporosis is a disease in which the mineral density of bone is reduced, its microarchitecture disrupted, and the expression profile of non-collagenous proteins altered. Normal fracture treatment is a complicated, multistage process, involving different cellular events and regulated by local and systematic factors. The objective of this study was to develop bio-active nanostructured materials, in both acellular and autologous cell-seeded forms to enhance bone fracture fixation and healing thought creating highly porous structures which will promote osteogenesis. The approach to develop highly effective hydrogels for counteracting the effects of osteoporosis followed different ways: (a) synthetic and biological polymer chemistry, by using a thermally gelling polymer and nanodiamonds (ultradisperse diamond UDD) (b) experiments with cell models (endothelial progenitor cells EPC). Our investigations demonstrated that in vitro EPC transformation to osteoblasts was enhanced in the presence of a osteoprogenitor medium and UDD. 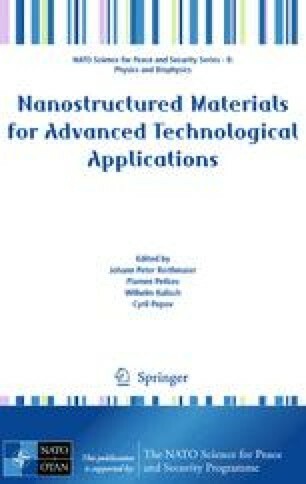 These results provided initial evidence that synthetic nanomaterials may exhibit certain properties that are comparable to natural one, and nanomaterial architecture may serve as a superior scaffolding for promoting EPC transformation and biomineralization.